Last summer,in the morning I went with my friends Karlo and Manuel at the beach.There were lots of people in a particular place. 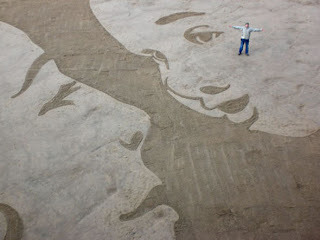 I went to see what was going on.After a lot of minutes waiting to see , I finally saw a man drawing in the sand. It was too weird and unusual. Firstly he drew a horse which was so wonderful and seemed like a real horse.Secondly, he drew a woman who was stading next to him.Lots of people came, asking him to make a portrait of them.Two hours later, a man who knew about art told him that this new way of art was so fascinating and wonderful that he could show it to other people by having an exhibition in a gallery.But he did not accept the proposal and I could not understand the reason. In the end, when he finished his work everybody applauded and cheered him. The message that I want to give from my story is that everyone has the ability and the imagination to invent new ways of art. What an interesting story and final message! Bravo Izoldi! You are very artistic yourself and you urge other people to discover their talents, as well! That's so wonderful and original story!! I really enjoy reading it! BRAVO!